For our 17th Ladies Golf day this season, we had a total of ­­­­116 participants, of which 5 were new golfers to our Monday Ladies Night. Tonight we played a 2 person format, therefore, the prize vouchers were awarded to the two person team with the 6 lowest gross scores. For some added fun we hid 2 Gnomes on the golf course on the back and front nine. A prize was awarded to the 2 golfers whose ball lands closest to the “Cedar Green Hidden Gnomes”. We asked the qualifying golfers to record their name on the marker and place it where their ball landed to indicate how close they were to the gnome. The golfer who landed closest to the hidden gnome on the front 9 (hole #9 ) was Natalie Giommi and the golfer who landed closest the gnome on the back 9 (hole # 18 ) was Bev Vienneau. Both ladies won green fees for 18 holes with cart for two golfers at Huron Pines in Blind River. This evening due to our reduced daylight hours, we had our first early shotgun start at 5:30. We hope that you can still join us on Mondays despite this recent change. On our last Ladies Night for our Wrap-up Night, we will be playing a 4 person scramble (unless you have a smaller group golfing together then it will be a 3 person scramble). This way we can ensure everyone is in the clubhouse at a reasonable hour for the dinner being served at this event. As of tonight, we have 80 ladies who have participated in 12 or more Monday Ladies Golf Days throughout this season. These golfers now qualify for the bonus draws held at our Wrap-up evening on Monday, September 18th Ladies can meet the eligibility criteria by attending 12 games by September 11th. There are potentially 31 more golfers who can meet this requirement before the deadline, which could result in a total of 111 women who could be included in the bonus draws at our Wrap-up Night. 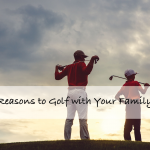 Some of these bonus prizes include a return flight to anywhere in North America, golf passes to Huron Pines Golf Course, and Bon Air Golf Club, Jewelry, hotel stays, gift cards, and other prizes valued from $25 to $250+. This evening Gerry Laferriere the maintenance and grounds keeper at Cedar Green has announced he will be making a personal donation of $1,000.00 to put towards our prize lot for our final wrap-up night. Remember golfers MUST be present at the clubhouse for the prize draws. For our final evening, the food and beverage manager Caitlin Craig will be serving a roast beef dinner for $20 and will provide an option of chicken (bone-in) dinner for the same cost, if that is your preference. Ladies can prepay their meal and specify their preference. If you wish to join us for dinner the bar staff will be accepting payment during the next 3 weeks. Please keep in mind that eating dinner is optional, as we know many ladies find eating a meal after 7:30 pm does not agree with them; however the prizes will be awarded during the dinner hour. This coming weekend August 26th and 27th the Cedar Green Club Championship is being held for golfers who members of Cedar Green. This is a 2 day event with assigned tee times, open to Ladies, Men, and Juniors. The cost is $25 which includes meals. For more details please contact the pro shop at 705-560-1090. Next week on August 28th we will be playing our game at a 5:30 pm shotgun start. Remember, due to the loss of daylight hours next Monday the shotgun start will be at 5:30 pm and we will be playing our own game. The twoonie pot in the amount of $213.00 was not won this evening, therefore, this amount will be carried over and added to next Monday money pot.